- The Google account sign-in process was updated from OAuth 1.0 to OAuth 2.0, given the deprecation of Oauth 1.0. Users of all previous versions of Earth will not be able to sign-in with their Google accounts after May 30th, 2015. - The "Enable Controller" option in user preferences is now turned off by default. This prevents red directional arrows from displaying as a result of uncalibrated joysticks and other controllers being connected to Earth at startup. - For enhanced security, "Use HTTPS for Google connections" is now toggled on by default. - We fixed a bug whereby the cache size rose above user-specified limits. - We fixed a crash resulting from searching on some Windows machines. - We updated the LEAP API to version 1.08. - We reduced LEAP controller sensitivity to user hand motions. This enables a smoother flight and greater control over your flight path when using a LEAP. - We have included another fix for the unified_cache_leveldb_leveldb2 directory filling beyond specified cache limits for some Windows and Macintosh users. - Imagery no longer stays blurry upon zooming in when the cache is full. - Font and tilt settings now stick between sessions. - Balloon opens now display when recording tours. - We have included UI improvements to Flight Simulator. - When printing, the scale legend now displays correct distances. - Collada models now display with uncorrupted textures. - Polygons and image overlays now display correctly across the Antimeridian. - We fixed an issue with certain GPU - driver combinations whereby no imagery displayed in the client. 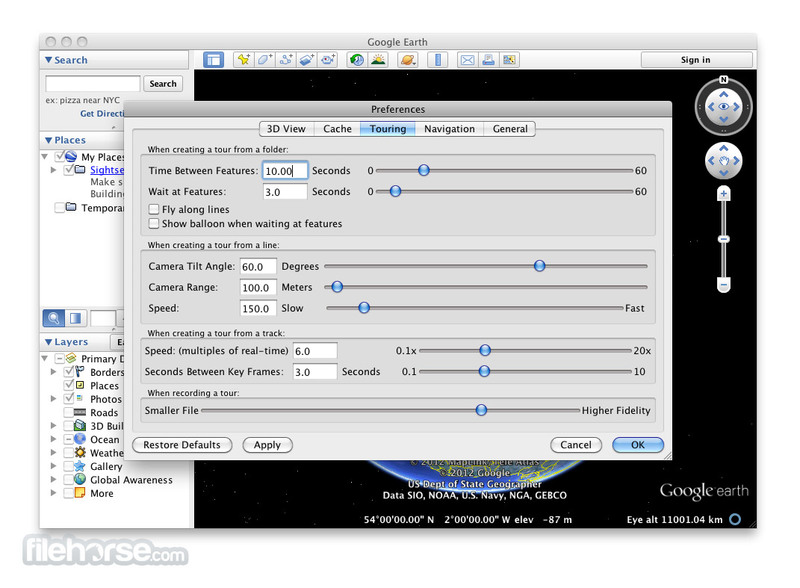 - The time slider in Sun and Historical Imagery features now displays the correct Daylight Savings time. - Google Earth Client: Put in a fix for the unified_cache_leveldb_leveldb2 directory filling beyond specified cache limits for some Windows users. - Google Earth Client: Now handles SSL certificate revocation errors appropriately. 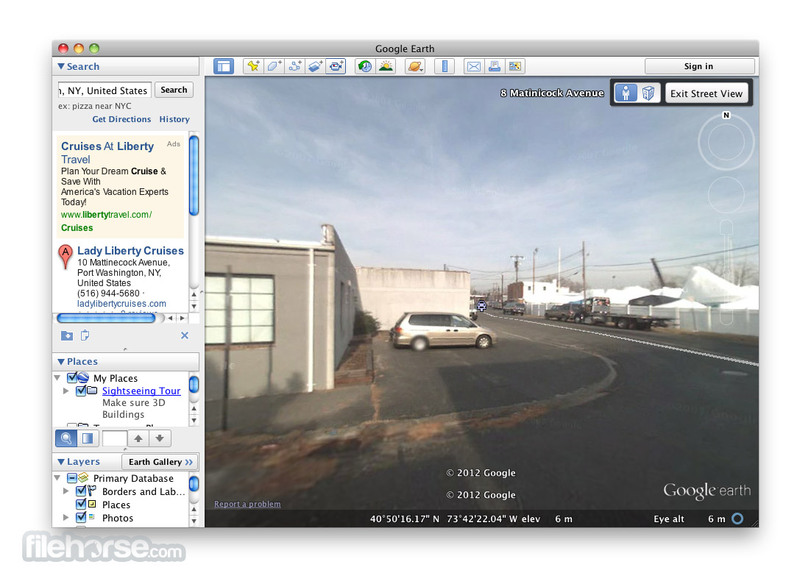 - Google Earth Client: Lighting of Diorama buildings in OGL now appears correctly. - Google Earth Client: Balloons no longer flicker while playing tours. - Google Earth Client: Improved the appearance of image and polygon overlays for users running some families of Radeon GPUs. 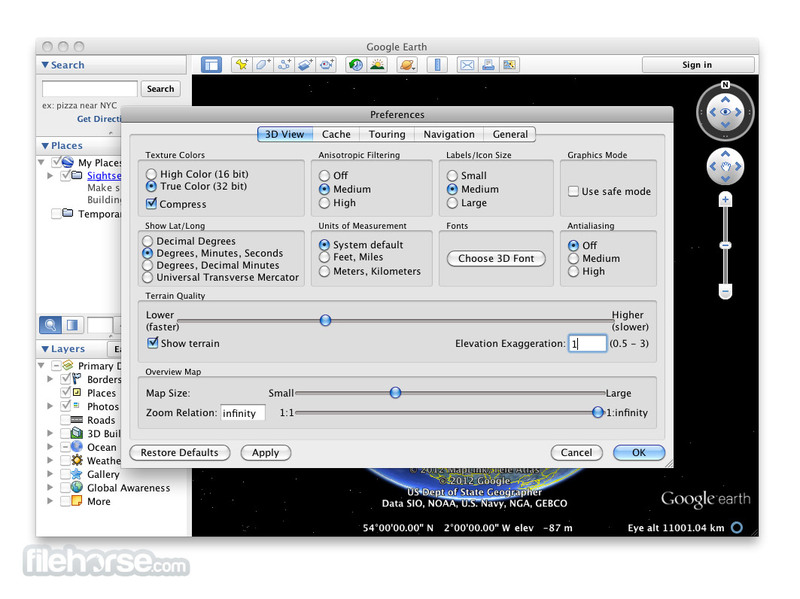 - Google Earth Client: Included stability improvements for users running GeForce 6xxx and 7xxx cards. 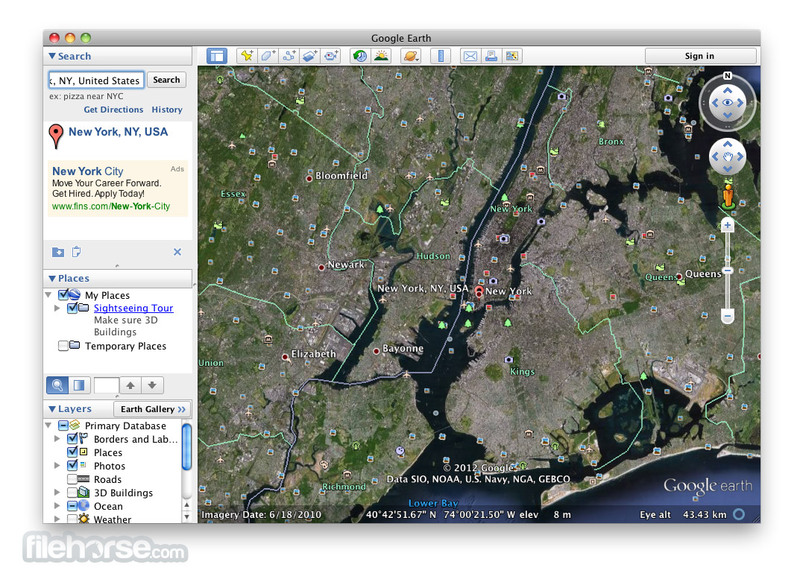 - Google Earth Client: Included stability improvements for users running Earth for extended periods of time. - Google Earth Client: Imagery now displays for Linux users running specific families of Intel GPUs. 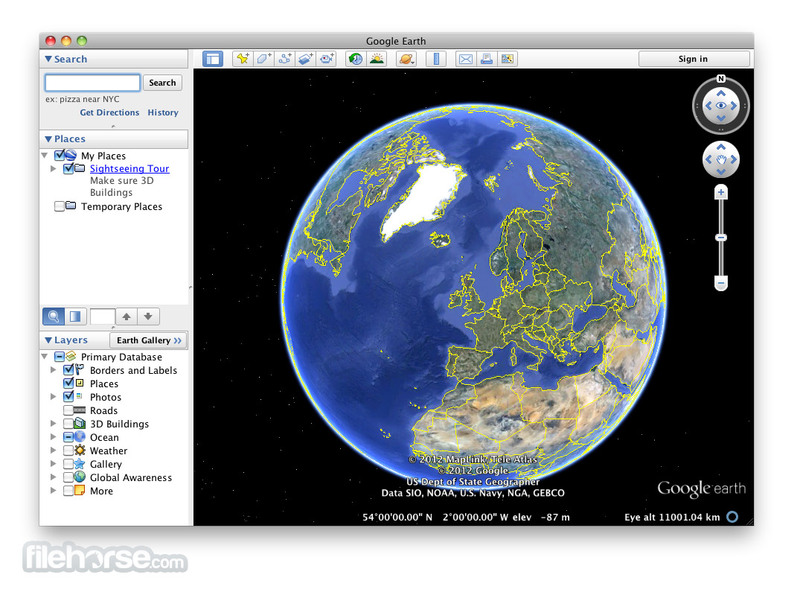 - Google Earth Plugin: Placemark and linestring quality no longer diminishes in the Plugin with browser refresh. - We have included substantial performance improvements to this build. You should see scenes load more rapidly than in our previous public Beta release. - We have included minor tweaks to the Tour Guide UI. - Google Earth Client: We fixed the bug that prevented users from recording movies from saved tours. - Google Earth Client: Wikipedia text displays in tours. - Google Earth Client: Gray buildings and extruded polygons have improved lighting effects. - Google Earth Client: Imagery holes no longer appear after sun has been turned on in DirectX on certain hardware configurations. - Google Earth Client: Icons align correctly upon installation of .dmg. - When run in DirectX mode on certain Radeon graphics cards on Windows, SketchUp models and extruded polygons will appear gray. To work around this issue, run Earth in OpenGL mode. - When run in OpenGL mode on certain Intel graphics cards, SketchUp models and extruded polygons will appear gray. To work around this issue, run Earth in DirectX mode. - Clamped Polygons and Image Overlays display multiple instances in 3D cities on certain hardware configurations. - KML overlays don't render correctly in 3D cities in DX on certain hardware configurations. - Water surfaces around coastlines will flicker then resolve upon zoom. - Placemark and linestring quality diminishes in the Plugin with browser refresh. To workaround, zoom closely into the KML you want to view. - Terrain and Water Surface oddities exist at the antimeridian. - Support for 3D imagery data: 3D data provides a comprehensive representation of metropolitan environments around the world. 3D imagery is currently available in the these areas. - Tour Guide mechanism in the client: The new tour guide allows you to explore interesting places around the world, even if you don’t know to search for them. As you move, thumbnails of pre-created tours and points of interest will dynamically update with interesting locations in your current view. Read more. - Fixed a Pro and Enterprise bug whereby cached login data disappeared after upgrading to Mac OS 10.8+. - Sound can now be recorded from a microphone when producing a tour. - Improved Atmosphere feature for users on certain NVIDIA GeForce cards. - PC Enterprise users will note flashing historical imagery when going to the minimum date of the time slider in a handful of areas around the world. To workaround, use 6.2 for Enterprise. - Terrain, imagery and polygons that overlap the antemeridian occasionally appear broken. - This build includes changes to shaders that strain older graphics cards. Please see system requirements for updated lists of recommended hardware. - Fly to your house. Just type in an address, press Search, and you'll zoom right in.